Here is a list of best free TIFF To PDF converter software for Windows. These software let you convert single page TIFF as well as convert multi page TIFF to PDF file for free. You can also convert single TIFF file using some of these, and some can also convert both single and multiple TIFF to PDF. Some software to batch convert TIFF to PDF also let you combine all the TIFF to create a single PDF file. Now, some of these TIFF to PDF conversion software are simple ones with no or very few options to set PDF conversion parameters. Some provide options where you can set various parameters for output PDF files, such as: page merge, preserve metadata, page layout, color adjustment, DPI, PDF encryption, file renaming, and more. As you checkout the list, you will get to know about the uniqueness of these free TIFF to PDF converter software and know how they work. This will help you select a software to convert TIFF to PDF according to your needs. PDFdu Free Image To PDF is one of my favorite TIFF to PDF converter software. It not only carries out bulk TIFF to PDF conversion, but also lets you apply PDF conversion parameters. You can also checkout the list of best free PDF To TIFF Converter Software, Multipage TIFF Viewer Software, and PSD Editor Software For Windows. The free version of Image TIFF Jpeg Text to PDF Converter lets you convert one TIFF to PDF at a time. It is designed to convert images and documents to PDF and lets you set various conversion parameters according to conversion being carried out. To convert TIFF to PDF, begin with loading a TIFF file that you want converted. From the PDF option window, choose the parameters you want to set for output PDF file. You can choose to merge multiple images into one PDF and define page size. Other PDF parameters that are available are there for other document type to PDF conversion. The converted file will be saved in the defined output folder. Its a good TIFF to PDF converter that can convert multi-page TIFF into a single PDF without any hassle. FastStone Image Viewer is not only an image viewer, but also an extensive image processor. You can easily use it as a TIFF to PDF converter software. You can use it to batch convert TIFF to PDF. It provides options to set output parameters for TIFF to PDF conversion, making it a desirable converter. You can set page size, page rotation, cropping factors, color depth, color adjustments, DPI, add text, watermark, and border. You can also tell it to preserve or forget original date/time attributes, and set file renaming parameter. The conversion process is easy. Select the folder where you have kept your TIFF file(s), and select the TIFF images you want converted. Go to Tools > Batch Convert Selected Images. This opens a new Image conversion windows. Add the images you want for conversion, select conversion parameters, and begin conversion. Its one of the best image processor software that can be put to use for a number of operations related to images. IrfanView is another image viewer and image processor just like FastStone, that can help you for free TIFF to PDF conversion. You can carry out single as well as batch conversion here, but remember, you will need to install a plugin for batch conversion. After downloading and installing IrafanView, get the Plugin pack from here and install it. Like FastStone, you will find many options to set conversion parameters. Set page cropping, resizing, DPI, color depth, color adjustments, page orientation, and more. File renaming option is also available. All the converted PDFs are multipage PDFs and are saved in the designated output folder. Many users like IrfanView for image processing, so its a recommended free TIFF to PDF converter for them, and non users as well. FreeVimager is a simple and free TIFF to PDF converter which lets you convert a single file at a time. It provides only two conversion options: convert TIFF to single page PDF or as multipage PDF. Its primarily an image viewer and editor, where you can carry out basic editing. If you want to make any changes, you will have to do it before conversion by editing loaded TIFF file. This TIFF to PDF conversion software is recommended if you do not need to convert files frequently and do not require many conversion parameters to play with. Its simple and easy to work with. XnConvert is a cross-platform image and document converter available for Windows, Mac, and Linux. Carryout single or batch TIFF to PDF conversion using this freeware. Add a file, multiple files, or a folder containing your files to convert. Before conversion, you can apply various actions to the images. Here Actions refer to image editing and adjustment, where you can add image adjustments, image mapping, filters, and various other effects. Set output folder, output file renaming parameter, and output PDF setting. Here you can set compression type and image quality of output PDF. If you want, you can save the output as multipage PDF or single page PDF. Various other parameters can be set before conversion. Its one of those converter tools that you must keep handy if you frequently need to convert files. It can carry out conversion between a wide range of image and document formats. RentASoft Image Converter is a free image converter that can be used to convert single page TIFF to PDF. Remember, you cannot convert multipage TIFF, as it will only process the first page. It has no advanced features to set output parameters, and is only ideal for TIFF to PDF conversion with no modifications. The best part about this image converter is that it adds itself into Windows’ context menu. So, you can select single or multiple files, right click and select “Convert image to..” option, as displayed above. This opens this software’s interface. Here select the Adobe PDF option and proceed with conversion. You can set a custom folder location to save converted files. You can also use it to quickly convert images to JPEG, GIF, GIF, ICO, PNG, etc. formats. PearlMountain Image Resizer Free has been developed as a freeware to help you resize, rename, and convert images. Converting TIFF to PDF is pretty simple here. You can carry out single as well as batch TIFF to PDF conversion. Begin with selecting the TIFF files to convert. Now, as you select the To PDF option, you will view options to set output PDF file parameters. Set output file name, page size, and select if you want all pages of TIFF to be converted to multipage PDF or single page PDF. All the converted files will be saved in the designated output folder. As this software is meant for image resizing, you will not find other customization options. You can use this free TIFF to PDF converter to convert images to JPEG, PNG, BMP, TGA, GIF , and PSD formats. Multiff is a free TIFF editor software that can be utilized as a TIFF to PDF conversion software. It only allows to convert one TIFF to PDF at a time, and supports multiplage TIFF to multipage PDF conversion. Simply load the TIFF file that you want to convert, go to File menu, and select the Convert to PDF option. You will be asked to select the output folder to save the PDF file. To make any modification, you will have to edit the TIFF before conversion. The editor lets you split TIFF, extract page, insert page, delete page, edit images, and more. This freeware is a good option for those who need to work with TIFF files regularly. Advanced Batch Image Converter is an open source image converter. It is named advanced because it can carryout image conversion among a huge number of image and document file formats. It lets you convert single as well as convert bulk TIFF to PDF. It also supports multipage TIFF to multipage PDF conversion. Do note that you cannot set advanced parameters for file conversion. When you have added the TIFF file(s) for conversion, you will need to go to the Advanced menu and activate all output formats. Without advanced mode activation, you will only get options to convert image to JPEG, PNG, TIFF, JP2, and WebP. Select output format as PDF after activating advanced mode, and begin conversion. You can manually select folder to save output PDF file. PDFdu Free Image To PDF is an advanced TIFF to PDF converter software for Windows. You can use it to convert multiple TIFF files to single PDF or single TIFF to single PDF. The best thing about this freeware is that you get various options to set conversion parameters. You can set page size, page layout, add watermark, etc. You can also encrypt output PDF and disable printing, copying, and modification if required. Add the PDF(s) that you want converted and begin the conversion. You can select custom output folder if you want. It is one of the best options available out there for custom TIFF to PDF conversion. The settings of this tool have been designed according to PNG files, so you will not find any option to set parameters for TIFF to PDF conversion. Free version of Icecream PDF Converter lets you convert multi page TIFF to multi page PDF. You can also use it to combine multiple TIFFs to make one PDF. I would like you to note that the free version only allows upto 10 pages per PDF per conversion. It lets you convert single as well as multiple TIFF to PDF at a time. The customization options provided by Iceream PDF converter makes it worth to use. You can set a password for created PDF, set image size, set page layout, set PDF metadata, set image quality, and enable OCR. Select output folder and begin conversion. Your files will be converted in no time. It is one of my favorite converter software, but the limitations in the free version makes me sad. DocuFreezer can be used as a TIFF to PDF converter if you need one for non-commercial purposes. You can convert single TIFF to PDF or batch convert TIFF to PDF using this software. Convert multi page TIFF to multi page PDF with just a single click. Output PDF settings let you choose if you want the output to be a regular PDF or a PDF-A file. Rasterization image resolution and Append options can can also be set according to your choice. Note that this is a free version, and puts small watermark on each page of PDF with its logo and website URL. It can be ignored if you are using this software for non-commercial purposes. 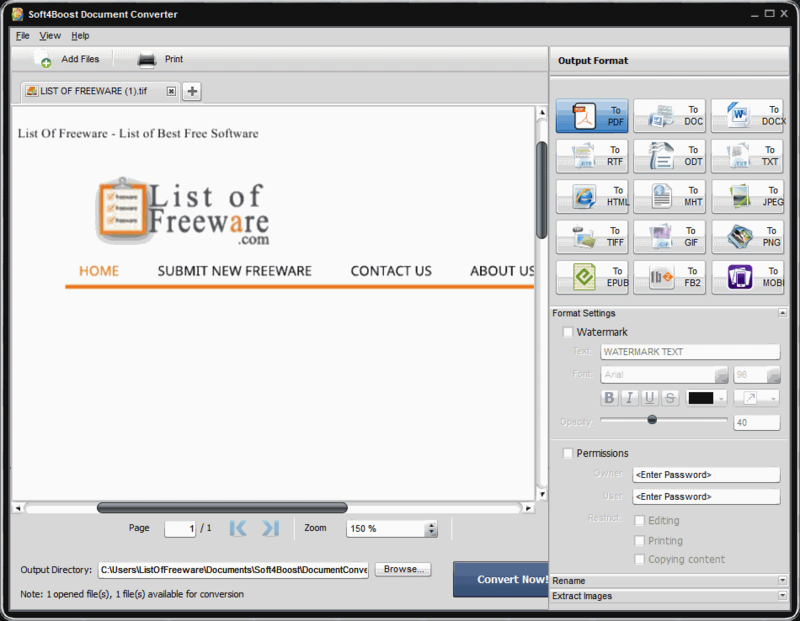 Soft4Boost Document Converter is an amazing and free TIFF to PDF converter. It lets you convert file formats between various document and image types. You can add multiple TIFF files in tabs and convert them individually, one at a time. For PDF conversion, this software lets you add watermark, add encryption, and add restrictions for editing, printing, and content copying. Multi page TIFFs are converted to multi page PDFs. You can also add file renaming parameter. The interface is really user friendly and I would love to use it to convert my documents. Doxillion Document Converter is a free software which can be used to convert TIFF to PDF from NCH Software. It also lets you batch convert TIFF to PDF. You can edit loaded TIFF images before conversion to apply various effects. Select PDF as output file format and begin conversion. The converted files will be saved in the designated output folder. This TIFF to PDF converter software is only free to use for non-commercial purposes. GIMP is a well known open source image editor and image manipulator software. It can be utilized to convert TIFF to PDF pretty easily. There is a reason why I have put it so down below in this list. It can only be used to convert single page TIFF to PDF. If you want to convert multi page TIFF to PDF, it will only convert a single page. Load a TIFF in GIMP, then go to File menu and select the Export option. Select PDF as export format and your TIFF will be converted. I like GIMP for its image manipulation capabilities, but the failure to convert multi page TIFF to PDF makes me sad. Using PDF Printer Software for TIFF to PDF conversion is another goof method. PDF Printers let you print, or say Save image files as PDF. This process can also be applied to convert TIFF to PDF. We have already covered some free PDF Printer Software, which you can checkout here.